An Imperial crown, encircled by the text: ‘Royal Engineer Services.’ This example—brass (gilt? ), 19.7mm diameter, maker mark: J.R.Gaunt & Son Ltd. London Eng. J.R. Gaunt & Son Ltd. London Eng. STAFF FOR ROYAL ENGINEER SERVICES. 1107. Helmet—Home pattern, para. 31. Helmet plate, the Royal Arms. 1108. Helmet, Foreign Service.—The white Wolseley helmet and white pagri with gilt spike and chin chain. 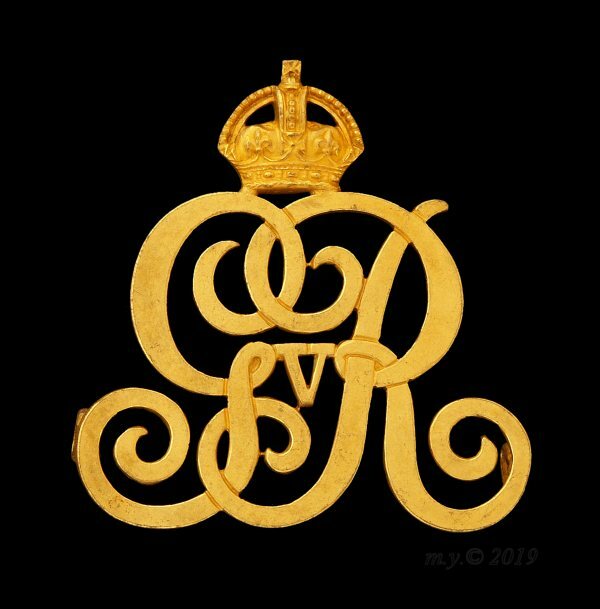 Badge—the Royal Cypher and Crown in gilt metal. 1109. Tunic.—As for infantry, para. 635, but of blue cloth, with bright blue cloth collar and cuffs. The front, collar, skirts, and slashes, edged with scarlet cloth and the skirts lined with scarlet. No collar badges. 1110. Lace.—Gold, Royal Engineer pattern. 1112. Trousers.—Blue cloth with scarlet cloth stripes 2 inches wide. 1113. Boots and Spurs.—As described in paras. 16 and 44. 1114. Sword and Scabbard.—Infantry pattern, Appendix VI. 1115. Sword-Belt and Slings.—Black morocco leather, 1½ inches wide, with detachable slings an inch wide, two stripes of gold embroidery, 3/8 inch wide on belt, and 3/16 inch wide on slings ; a hook to hook up the sword. Embroidered sword piece. Billets and gilt studs. 1116. Waist Plate.—On a frosted gilt or gilding metal centre, a crown in silver. On the circle the words ” Royal Engineer Services.” Oak-leaf ends. 1117. Sword-Knot—Gold and crimson strap with gold acorn. 1118. Shoulder-Belt—Black morocco leather, 2 inches wide, with two stripes of gold embroidery, each 3/8 inch wide, on the outer edges. Chased buckle, tip and slide. 1119. Pouch.—Black patent leather flap 5 inches long and 3½ inches deep. Gilt leaves for loops. Badge, the Royal Cypher and Crown in gilt metal. 1120. Great Coat.—Universal pattern, para. 30. Shoulder straps edged with scarlet cloth Finch wide ; in the centre a loop of bright blue braid from the shoulder seam round the upper edge of the button hole, the sides of the loop 1/4 inch apart. 1121. Forage Cap.—Universal pattern, para. 21, blue cloth ; band and welts of bright blue cloth. Peak embroidered with 3/4 inch plain gold embroidery for officers of higher rank than captain. Buttons as for mess vest, but die-struck. 1122. Forage Cap Badge.—The Royal Cypher and Crown in gilt metal. 1123. Frock Coat—Universal pattern, para. 27. Buttons as on tunic. No collar badges. 1124. Trousers.—As in full dress. 1125. Boots.-Wellington ; with box spurs for officers above the rank of captain. 1126. Sword Belt, Sword Slings, Sword} As in full dress. Slings are not worn unless the sword is carried. 1127. The pouch belt is not worn in undress. 1128. Cap.—Universal pattern, para. 23. Badge as for forage cap, but in bronze. 1130. Jacket—Universal pattern, para. 33. Buttons, gilding metal, die-struck. No collar badges. 1131. Breeches.—Mounted officers, universal pattern, para. 18. Dismounted officers, knickerbocker pattern, para. 19. 1133. Leggings.—For officers above the rank of captain, brown Stohwasser–pattern. 1135. Boots.—Brown, ankle, para. 16. 1136. Belts.—Universal ” Sam Browne” pattern. 1137. The provision of service dress is optional. 1138. Khaki Drill Jacket.—As described in para. 34. Khaki Helmet.—As in para. 32. Remaining Articles.—As on home service. 1139. Mess Jacket.—Blue cloth, with bright blue cloth roll collar and pointed cuffs. Cuffs, 6 inches deep at the points and 2¾ inches behind, a 1-inch slit at the seams. Shoulder-straps of bright blue cloth, 1½ inches wide at the base, tapering to about 1-inch at the points, rounded points fastened with a small button. The shoulder straps to be sewn in at the shoulder. Badges of rank in metal. No buttons on the front of the jacket and no gold braid or piping. No collar badges. 1140. Mess Vest—Bright blue cloth, open in front, no collar, fastened with four ½-inch mounted buttons. 1141. Overalls.—As in full dress. 1142. Boots.—Wellington; box spurs for officers above the rank of captain. ..(Full Dress, Tunic)… 1723. Collar Badges.— In gilt or gilding metal, frosted, a circle bearing the words “Royal Engineer Services” in bright letters; within the circle a silver crown on a frosted gilt dome. …(Service Dress, Home Service)…1743. Jacket.—As in para. 43. Collar badges as for the tunic but in bronze. …(Service Dress, Abroad)…1753. Khaki Drill Jacket.—As in para. 44, with collar badges as in para. 1743. …(Mess Dress)…1757. Mess Jacket.— ………..Collar badges as on the tunic.